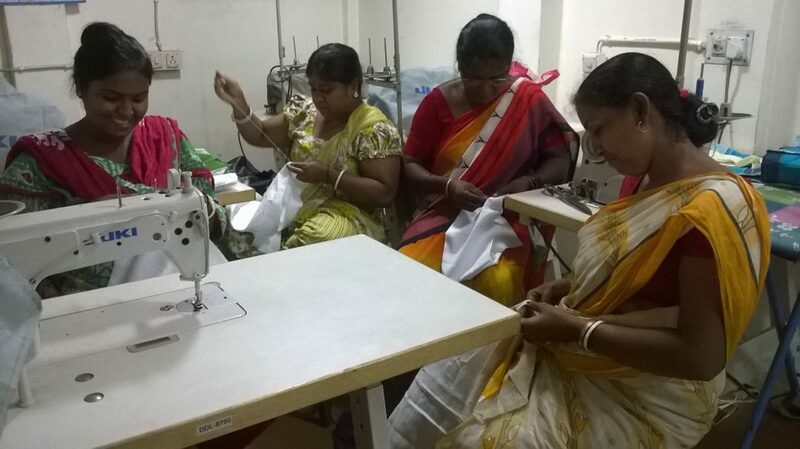 We have just received an update from our Women’s Empowerment project in Kolkata, India. The project is run by our partner there, Cathedral Relief Service (CRS). They provide skills training for more than 300 women in slum communities so they can set up their own small businesses and provide for themselves and their families. CRS also provide education about health and rights for the women. The aim is to create awareness about gender discrimination in order to bring about changes in people’s attitudes towards discrimination against women. Since the beginning of 2018, women have been developing their skills through tailoring, beautician work, and Juki machine training. Women are also taking an interest in attending a local cooperative called the Nari Dana production unit. Here they have learned to operate Juki Machines and have been earning regular income for their families. One woman who has benefited from the project is Rumpa Sapui. Rumpa is a widow who lives with her elderly mother-in-law and two children. Her son was the only working member of the family, while her daughter was studying. Since Rumpa knew about stitching, she was provided with paid work at the Nari Dana production unit. Part of her work included training. Rumpa is happy that she can now support her family. “I now am earning a substantial amount to cater to my family’s needs. I feel proud to be part of Nari Dana. I am looking forward to more work”, she said. It’s a good news story all around for Rumpa and for the other women who are part of this project!